Groom portraits are just as important as bridal portraits. The groom plays a pretty big part in the wedding too! For Justin and Melissa's wedding, we started out with the bride and her bridesmaids. The groom was just down the road. Neal left me with the ladies and went over to see Justin. These getting ready portraits came out amazing! Neal found the best light in the house and moved a few chairs out of the way for Justin to sneak in. Justin looked awesome in his tuxedo. Neal wanted for go very GQ magazine style for this groom. He had Justin hold part of his lapel. 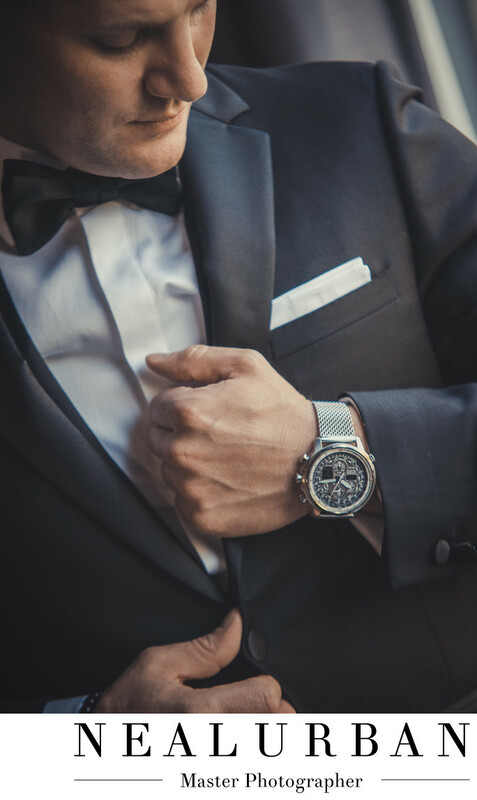 Neal noticed his cool watch and told him to pull back the suit jacket to expose the watch a little more. Then go back up to the lapel. With the other hand, go to the buttons. I love how Neal Urban framed this. It sort of focuses on the watch. But you can still see part of Justin's face looking down and his other hand on the buttons. The pocket square and bowtie add the perfect touch for a high fashion wedding! The bride and groom had their ceremony at St. Louis RC Church in Buffalo. We went for photos (idle) at the theatre district on Main St. The reception was held at Salvatore's Italian Gardens! Location: 6461 Transit Rd Depew NY14043 United States.